Mila 2.0 is Debra Driza’s bold debut and the first book in a Bourne Identity-style trilogy that combines heart-pounding action with a riveting exploration of what it really means to be human. The following review is based on an eARC provided to me by the HarperCollins UK via NetGalley in exchange for my honest opinion. I’m not usually a big fan of science fiction but after reading Debra Driza’s wonderful debut I will definitely have to rethink my stance toward the genre! Once this book got moving it had me on the edge of my seat and despite Mila’s not-quite-human nature, I never had problems connecting with her, so if this is something that usually keeps you from reading SF don’t let it deter you in this case! From the description, I knew going in that Mila was actually an android. However, she is so incredibly human that I sort of forgot, or at least didn’t think this fact through properly and draw the consequences. Mila is trying to fit in at her new school, but she’s still reeling from her father’s death a few weeks ago. They were very close and she goes over their memories together over and over… apart from the one spot she doesn’t remember – the day their house burnt down and he died. What’s worse is that Mila cannot really share her grief with her mum because she has withdrawn from her since the fire and their subsequent move to the middle of nowhere, Minnesota, and Mila often wonders whether her mother even loves her anymore. Things change when Hunter moves to their small town. Mila’s ‘best friend’ Kaylee (I never liked her, but then again one isn’t supposed to) has the hots for him… as does Mila, and pretty much everyone else. But Hunter is interested in quiet Mila. They connect and have a couple bonding conversations… until a car accident changes everything and Mila finds out about who and what she really is. And let me tell you, even though I theoretically ‘knew’, or thought I did, my mind was still scrambling to catch up with everything. Because it wasn’t how I thought it would be! Mila’s anguish at finding out that she isn’t human and that everything she believed was a lie was palpable to me as a reader. I ached with her all the way and I felt so incredibly sorry for her! After that revelation, things go out of control and Mila and her mum have to run. From then on, the book is one big adrenalin trip that goes so many places I hadn’t anticipated and managed to surprise me over and over! Maybe it’s partly because I’m unfamiliar with the genre but once we left ‘high school’ I found the novel to be completely unpredictable, right down to the ending. It’s really hard to talk about this book without spoilers, so I will have to leave the plot alone for now. As I’ve said I thought Mila was a fully formed and deep character. She really struggled with the idea that she was supposed to be inhuman, not real, a machine, even as her enhanced ‘functions’ started to come in more and more handy. Her mum was equally complex and I hope to find out a bit more about her past in the sequels, which I will definitely read. Another character that I came to love is Lucas but I unfortunately can’t say more about him apart from the fact that I hope I haven’t seen the last of him. As for Hunter… he’s part of the bit I wasn’t one hundred percent happy with in the book. I get it that Mila is attracted to him, and it makes sense with her past and all, but I just didn’t find him to have that much substance. He was sort of elusive. I mean what does Mila really know about him? I understand how she latched on to him because he was one of her few non-fake good memories, but I do wish his description was a bit more varied than her remembering his “lopsided smile” so many times. I wish they would have been given a bit more time before they were torn apart; it would have made the romantic angle of the novel more believable to me. I hope this, too, will be deepened in the sequel. Apart from that I can find nothing to complain about. The plot was surprising and utterly engrossing. It was ultimately different from what I expected, but in the best possible way! There was plenty of action but the plot wasn’t rushed and unfolded naturally. The scientific elements were described in a way that made them shockingly believable. In our age of 3D printers and whatnot I could actually imagine something like this happening. Mila’s abilities were as amazing as they were frightening. The novel touches on some of the big questions – what makes us human? How far may scientific research go until it becomes hubris? I liked that these themes were not explored in a heavy-handed way. It made me think because even though the issues in themselves are not new, Mila’s perspective was. Overall, I think that sci-fi fans and action junkies will take as much away from MILA 2.0 as those readers more focused on character and beautiful writing. This novel definitely deserves the hype it got even prior to publication! I am very curious to see Mila’s journey continue in the next installment of the series. What are your thoughts on the book and my review? Have you read something similar? Also, if you'd like to check out Debra Driza's writing, her prequel-novella MILA 2.0: Origins is free on Amazon and B&N. I enjoyed this one too, and hope we get to know and love Hunter even more int he next book. Hi Carmen! I'm a new follower (found you through goodreads). 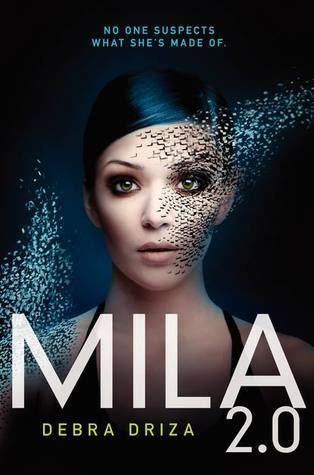 I loved your review of Mila 2.0, it captured everything I felt about reading the book, especially the surprise at the Android reveal and the slight annoyance about Hunter. I'm so excited for the sequel! Hi Kathryn :) So nice of you to check out my blog after reading my review on goodreads! I'm also very curious about what will happen in the sequel after that ending! This could go in so many different directions... I'll check out your review now! I also enjoyed this book, especially after I got to meet the author this past May at the Romantic Times Convention in my hometown. Great review! I remember hearing a lot about this book prior to its release and I was curious about whether it was truly worth all the hype that it received. Clearly you agree with the hype and I am glad because that is all the confirmation I need to add that book to my To-Read list, which only seems to grow as I continue to read through various reviews. The ever-growing TBR list... both a thing of awesome and a thing of terror :P It really is a good book, though I was sceptical going in because of the hype!